J.T. 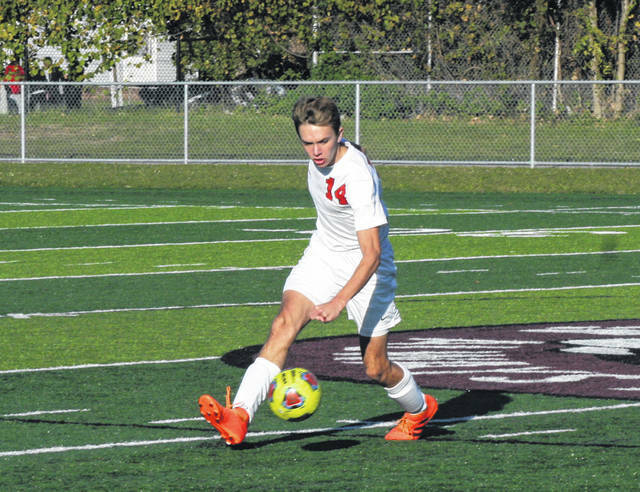 Hutchinson of Wauseon kicks one up the field Wednesday at Toledo Scott in a Division II boys soccer sectional final. The Indians won by a 2-1 final. Ethan Glover of Wauseon, left, tries to keep the ball on Scott’s side of the field as their Jaali Peterson (20) defends. 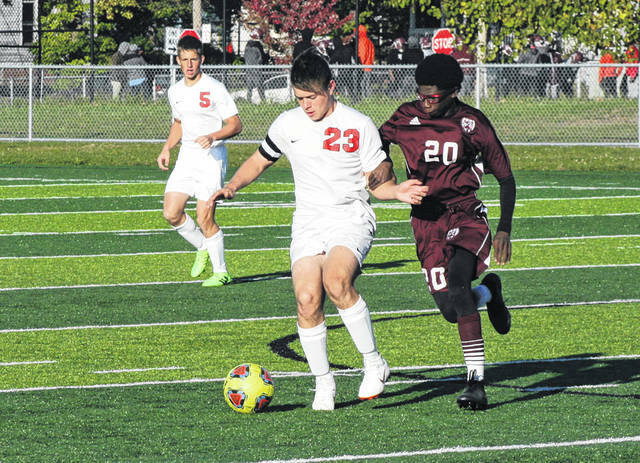 TOLEDO – When it looked as though Wauseon was headed for an early exit out of the Division II boys soccer sectional tournament, they persevered. The Indians scored twice in the 6:30 to defeat Scott, 2-1, in the sectional final. Although they have been in many close games throughout the season, this result is one that is somewhat new to them. The two teams were pretty even, but in the second half Scott had many near misses. Their relentless pressure finally paid off when Jaali Peterson bent one in from 30 yards out, putting them in front 1-0 with 16:11 left to play. However, Wauseon did not panic and they would come through in the end. The equalizer came on an outlet as Aaron Newland elluded an overaggressive keeper who tried to beat him to the ball, firing it into the back of the net with 6:27 remaining. The Indians did not play for overtime, however, as Fernando Soto found an open Jacob Hageman who scored the go-ahead goal with 3:24 remaining. The Indians advance to take on Maumee Monday at Lake in a district semifinal.